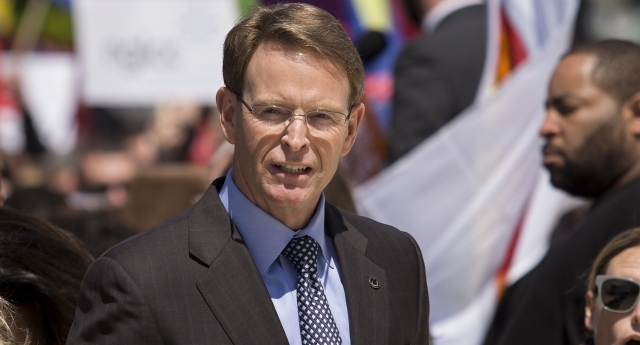 Tony Perkins, the leader of the anti-LGBT Family Research Council, will advise the Republican Party on policy. The notorious Christian activist has made a number of extremely disturbing claims about gay people in the past, insisting that gay people will attempt a ‘Christian Holocaust’. He claims that Christians are being sent to “camps”, and that soon gays are “going to start rolling out the boxcars to start hauling off Christians”. Despite these claims, Mr Perkins will serve as a Delegate at the Republican National Convention this year,, where the party will confirm its Presidential nominee – and will also sit on the Republican Platform Committee, advising the party on its policy. He wrote: “We may not know who will be representing the GOP at the Republican National Convention, but I know one person who will be representing Louisiana — me! “For the second time, I’ll be serving as a delegate for my home state when the Cleveland event gets underway July 18. The Family Research Council is listed as an active anti-LGBT hate group by the Southern Poverty Law Centre. Perkins has also claimed that letting gay people serve in the Boy Scouts will increase the risk of child molestation. Despite insisting he is simply an activist for ‘religious freedom’, Perkins simultaneously says that clergy who support gay rights don’t deserve “true religious freedom”. Ahead of the Supreme Court court ruling in favour of equal marriage, Perkins threatened a “revolution” in the United States over the issue.